Color and its use and abuse is a very personal thing—especially the “abuse” part. 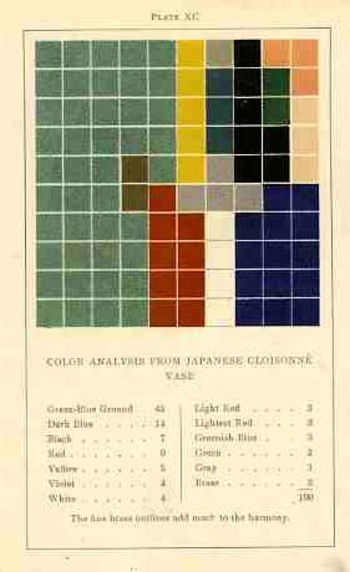 The pamphlet below (Views of the New York World's Fair, 1939, and published that year) to me is certainly one of those entries in the history of the abuse of color, not so much that the colors used in it are odd together, but the saturation of color across the board leads to something like Splendorama hyper color. I'm not sure why the colors are like this--they remind me of a color equivalent of a laboriously and not-very-good translation of a tech manual. It isn't as though color printing was new in the publishing industry, as books had been printed in different colors besides black for at least 300 years by this time; even full-color printing had been around for 120+ years, so it isn't as though they were experimenting with the color equivalent of newly-available typefaces in a 1985 word program. Color photography in books is brand new at this point, the wide-scale use taking place this year, but these images are not photos, so I doubt that this had much of an effect on the creativity of the designer. Since a few of these images are quasi-sci-fi, I even wondered about the color influence in speculative novels and movies. Color was very adventurously used int he early sci fi pulps and monthlies, but that stuff was already being employed for two decades by this point so their newness in regard to publishing experimentation is not an issue. And so far as sci fi and color in the movies goes, that also wasn't an issue because it didn't exist yet, as the first color film1 in that genre didn't appear until Lesley Selander's awful Flight to Mars (1951). In short, I don't know what is going on here, color-wise. 1. Flight to Mars, from Monogram Studios, was about a manned flight to Mars in 2000, There was another unusual film, I think it was Destination Moon at about the same time, where the spaceship overshot the Moon and went to Mars instead. This note though is in regard to the Georges Melies film, Le Voyage dans la Lune (1902), which did have some color, though that was tediously applied by hand in post production. (Invaders from Mars (1953), by the director William Cameron Menzies, was the next sci fi flic made in color. There's just something very simple and calming in the arrangement of the colors in these photos--and of course something very different from what one comes to expect in interior design. This is so much so that I think it would be possible to take an entire two-day vacation in a house that is decorated in just this fashion. Your brain would be relieved of the expected and introduced to the soft exceptional with a color palette equivalent of an all-white-food carbo breakfast that one could slide under a bathroom door. I think you would take a seat with a good book, and then fall immediately to sleep--not from boredom, but from the unexpected luxury of color-unusualness and perhaps a little whiff of the grandparent's house, the colors surrounding you having the optical qualities of the heat from a good fire. If we were seeing movies of folks gathered around the radio and listening to the end-of-the-war stories in 1945 in a set like the images below, we wouldn't picture the black-and-whiteness to purge itself into this allotment of soft color. Of course if you spilled coffee on the rug (the color of Ronald Reagan's shoes) no one would ever notice. "For this condition, I will prescribe, for your information, a marvelous cure, the result of my experience in such cases. Take a precious stone we call sapphire. Powder it most thoroughly in a metal mortar and store it in a golden vase. Put a little into the patient's eye every day and he will soon be cured "-- from the Medieval medical text De Oculis, by Benevenutus Grassus, Stanford University Press, 1929, page 58. Admittedly I was more interested in the illustrations in this work1 than the text, mainly (and obviously) because the images are so striking. The text is in its way a pre-scientific attempt at 'curing" color blindness, which is a genetic disorder. The color wheels ("variable speed rotary color vision stimulator") were intended to be rotated to produce different color senses for "color vision stimulation"--it could be used to determine whether or not color vision was being "improved". 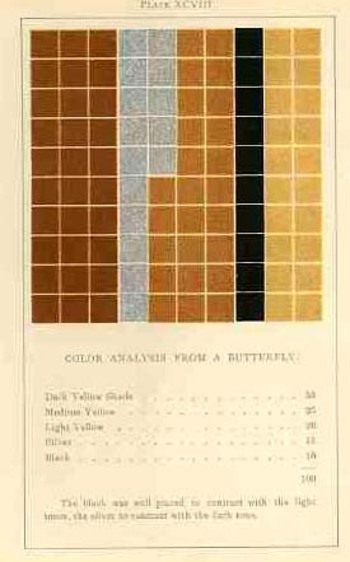 The idea that Coble is writing about (color and kids and the education of young children in the different forms/varieties of color and how colors are produced) is very interesting, and no doubt that the set of color blocks used in the exercises would have been lovely in themselves, but I think the author would have made more headway had he had at least one color illustration. And that dead black? They mean it. Or meant it. Jarring experiences are good as displacers of the stuff that you've come to know without knowing and without explanation because they make you think about these things--along with thinking about why you haven't though about thinking about them. For example, color: on the low end there is seeing Cary Grant in color (which is half-expected) and then seeing Humphrey Bogart (which is less so). Seeing Star Trek in color for the first time in 1967 at my grandparents' house (a small miracle in that they only could receive a few stations with a good antenna given the mountains and such in that beautiful and then two-season Great Barrington MA). I'm reminded of this today while looking through a decorating pamphlet by Johns-Manville from 1941. The images of the interiors of the Standard American Home started out in the pamphlet in black and white, and then, suddenly, came the appearance of color--and a lot of it, and in unexpected combinations. And then: unexpected colors in the unexpected color. And in this case, perhaps the new color scheme is not one that is today seen as a beautiful thing. It is an unusual exercise--for me, anyway, a mostly b+w guy--to imagine these colors, together. It is also surprising because my experience with so many of these catalogs is from an earlier period and the majority of them were illustrated with black and white photos or color drawings, or colorized photos. To see the color of the real walls and doors and tiles and carpeting is jarring. Nothing quite says no-color as German deep noir of the mid- and late-1920's. These movies can be so deep and contrasted, so very black-and-white, with such stark Moon-like shadows, no dawn or dusk just night and day, that it can make you forget that outside of the photographs and movies that people were moving around in great swirls of color. And nothing quite helps you to remember this than by having a look at a book like one below, a DIY piece printed in Berlin in 1927, the Farbige Wohraume1. It is of interest here because in addition to blueprints and sections of the furniture to be built, there are associated illustrations showing the completed work placed in a decorated room. And it just so happens that these rooms are highly, colorfully decorated--not that there's so much in the room, per se, but there is definitely a lot of color. 1. Farbige Wohnräume, 24 Tafeln farbig dargestellter neuzeitlicher Räume (5 Wohn-, 6 Speise-, 6 Herren-und 7 Schlafzimmer) mit den einzelnen Nöbeln im Masstab 1:20. Dazu weitere 24 Tafeln mit den zur Anfertigung erforderlichen Grund- und Aufrissen und Detailschnitten einschliessich der Sitzmöbel. Berlin, Verlagsanstalt Deutschen Holzbeiter Verbanes GMBH. Rebound in library cloth, very nice, workable copy. 37x26cc, 24 color plates of room designs, followed by 24 heavy leaves of associated blueprints printed front and back, these showing a profile of the furniture to be constructed on recto and some cutting instructions on verso. The color illustrations of the furniture in a room setting is correlated with the blueprints in rear, each of the color plates with a corresponding sheet of blueprints. Only four copies located in WorldCat: Yale, University of Illinois, Grand Rapids Public Library, and Cornell. Well: this is a variation of yesterday's post on the two opposite edges of color in oddly-applied scientific/technical manners. In unwittingly responding to the question "when is color-use bad? ", the answers were found in these room decorations from 1942, all of which come from a pamphlet entitled Ideas for Old Rooms and New, extracted from the mind of Hapel (?) Dell Brown. It is a tidy book with ideas that are anything but tidy;and as you scroll down you'll see that the room solutions suggested by Hapel Del are anti-tidy; clutterous (no, not a word but could be). Everything about these creations speaks to the annihilation of visual resting places; everything seems to be an affront to the concept of causal emptiness. The weird thing is that there aren't very many objects in these rooms at all (at least comparing these rooms from where I'm sitting)--the visual complaints seem all rocketing from the abuse of colors found in the fabric of the furniture and walls and floors and window treatments. The eye gets no rest--and as a matter of fact, the cones of the eyeball are impaled on the rods as a result of the author/decorator desperate attempts to invent three more primary colors. Believe it or not we don't really get the full flavor of the color cacophony because the floors in these picture look sort of benign, fading away into themselves--which they are not, according to the description in the text, because they are all high-gloss linoleum rolls or tiles ("efused [sic] with deep wondrous color". And that means not only are these floors adding sheen and color to the rest of the incredibly colorful--an effect fairly lost in these photos--they are also cold. One thing that I haven't pointed out in this peon to syrupy/pastel-y/techno-gelatinous-chromodrama is that they were all done in response to a re-decoration of a perfectly nice-looking house, with all of the former "bland" colonial-style rooms presented in glorious black and white. I'd rather live in Maison Noir than in this happy nightmare. This thinking came to the surface again this morning when I uncovered the Paint Specifications for the Model School, prepared for the East Cleveland Board of Education under supervision of the Foremost Authorities, and published by ARCO in 1939. It reminds us that the only thing that lived in black-and-white in those days are in our memories. (I've written about unexpected color in Lost German Color of 1927, The Very Describale Macro Color of 1937, The Color Green in the History of Squares, and of course the non-immortal 200,000,000 Pounds of Buttocks-or-Putting the Black-and-White back into Color, and others. Confectionary connections to interesting bumps in history wind their ways along many unusual paths. One such story is that of physician/scientist/collector Hans Sloane (1660-1753) and his introduction of chocolate into England (as a result of a field expedition he took to Jamaica)--his involvement with chocolate was minor compared to everything else he did in his life, but the introduction of chocolate to coffee houses in London was not. In any event it was his massive and superior collection of natural history samples, archaeological artifacts, and much else, that became the basis for the British Museum--the collections purchased from his estate for 20,000 pounds at the time of his death. I wouldn't use the term "great" here--and I'm pretty sure that the word is being misused here in 1893 as well. Gunther collected big stuff, the biggest being the prison. He purchased it and had it dismantled, shipped up to Chicago, and then reassembled (with the help and advice of the prestigious architecture/design firm of Burnham and Root) where it operated as a museum from 1889-1895. Sensing a brighter future for the property, Gunther dismantled the building selling off chunks of it as souvenirs, and built a convention center on the site, filling the need for meeting space from the burning of the Chicago Coliseum in 1897. This post could have gone another way very easily, winding up in the Things Out of Place Department--Libby in Chicago, the Statue of Liberty in Paris, London Bridge in Arizona, a duplicate Earth in the sky above the Earth,and so on--perhaps this on another day. JF Ptak Science Books Post 1282--continued, & now with the Full Text book! The idea of how we put parameters to something like the visual field is a gargantuan topic—it is something that architects and geometers and physicists and mathematicians (in general) have dealt with forever. The full text is available HERE via Internet Archive. Color theory is old and pretty—as a matter of fact there is a very attractive gathering of color theory models (in black and white, though) displaying some two dozen or more color models from the last 400 years. People like Della Porta (1593), our old friend and resident oddball polymath crank Kircher (1646), the smarter-than-you-could-imagine Newton (1660), Waller (1686), Lambert (1772), the wide ranging and again polymathic Goethe (1792), Herschel (1817, who also ushered in our understanding of the other light-sensitive shape spacing medium of photography in 1840), the semi-forgotten Chevreul (1835), the beautiful Maxwell (1857), Wundt (1874, the early experimental psychologist who also looked for spirits/spiritmus and ghosts), von Bezold (1878), Rood (1879), Munsell (1918) Kandinsky (1914 and not decipherable by me) and Klee (1924), and so on towards the present, all tried to analyze the prospects of color. Not in this list is the very highly problematic Emily Vanderpoel, who in 1901 and 1903 produced (in two editions) a lovely but mysterious book called Color Problems for the Layman, in which she sought not so much to analyze the components of color itself, but rather to quantify the overall interpretative effect of color on the imagination. I know this sounds begging and vague, but I really haven’t been able to make much headway in the work. I’m attracted to this effort because of its attempt at quantifying such abstract thoughts. By virtue of this effort, though, Vanderpoel had produced a strikingly illustrated book, with 118 color plates, all very intense, and beautiful, and in its way exceptional—unique for it time perhaps. Had the book been written thirty years or so hence we’d call it some sort of constructivist/constructionist artform. But since the artwork in the book comes a decade before the first non-representational artwork in human history (or so), I don’t know exactly what to call it. I really don’t know what it is, but I know that it is not entirely accidental, this pre-non-representational artform, because controlled geometrical color art is not accidental. In trying to quantify the color images of the objects in her study, Vanderpoel establishes a 10x10 square grid, dividing all of the color in that object into individual units numbering to 100. Then, somehow, she identifies the major colors and places them according to a system that I cannot understand within the grid. The net effect is glorious. I just don’t know how she got there—which isn’t normally a consideration in art, except that this work is an instructional on how to understand color in art and nature, and the explanation of the procedure is ethereal. Vanderpoel was and remains a respected author on porcelains and other applied and plastic arts. In this work she looked at her fair share of porcelain, limogues, clay pots, burial urns, glass shards, and the like; she also analyzed clouds, mummy cloths (and casings), dew on morning grass, brocade, the eye of a blue jay, feathers, and another hundred or so poetic arragenments of the stuff of teh world. I still do not know what this book is trying to tell me, but I do know that it is remarkable. 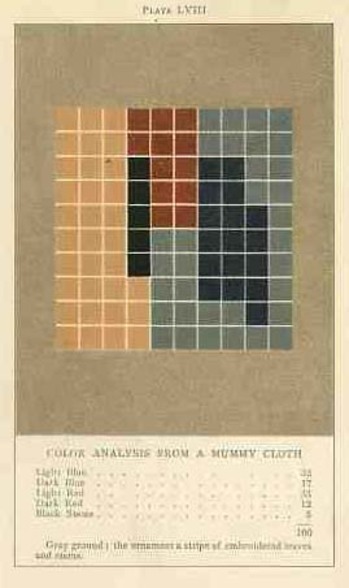 "Colour Blindess in Relation to the Homeric Expressions for Colour", from Nature Magazine, volume 18, p. 676, 1878. 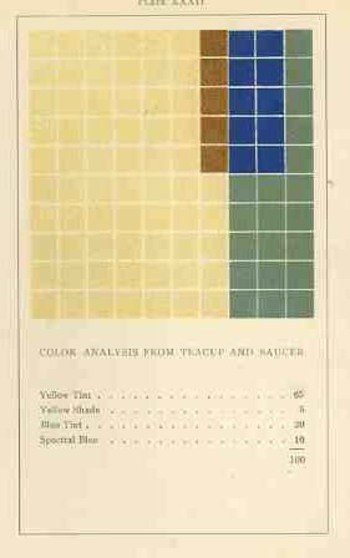 "In an article on "The Colour Sense" in the Number of the Nineteenth Century for October last, Mr. Gladstone points out certain peculiarities…in the expressions of colour used by Homer. "Although" he says "this writer has used light in various forms for his purposes with perhaps greater splendor and effect than any other poet, yet the colour adjectives and colour descriptions of the poems are not only imperfect but highly ambiguous and confused". 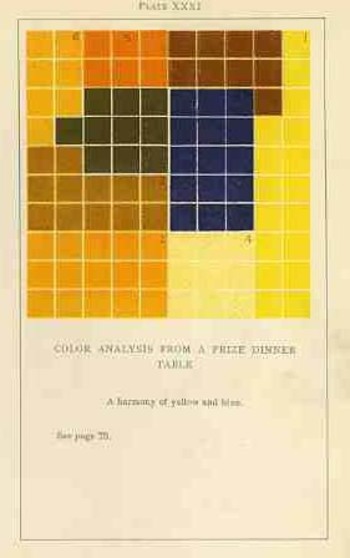 And again-"we find that his sense of colour was not only narrow, but also vague, and wanting in description".